The sales and production figures for December came in about where we’d expect – an active market with less inventory and fewer sales. 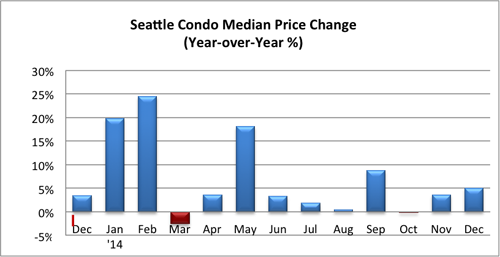 Historically, median price increases in December over November, but not this past year as December’s citywide median condo price stood at $260,000. That’s a one-month decline of 4.4% and a year-over-year drop of 19.13%, which was the largest YOY decline recorded over the past four years. However, I still believe that’s due to a combination of the soft market AND sales that were spurred by the first time buyers tax credit. For instance, 62.1% of all sales last month (87 units) were priced below $300,000 compared to only 38.9% (37 units) in December 2008. 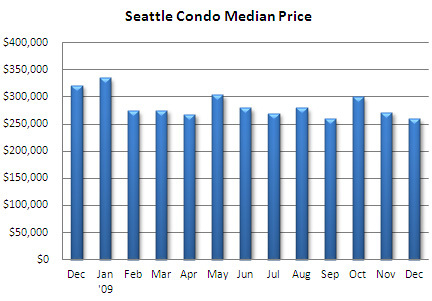 As a result, the median price point was weighted towards the lower end of the price spectrum. 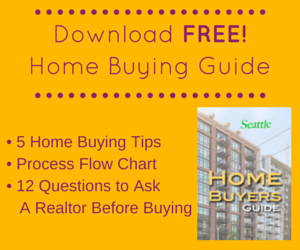 The median is the mid-point where half of the sales are above and half are below. While the one-month sales volume fell from November to December, the year-over-year figures showed marked improvement. Compared to December of last year, pending transactions were up 21.1% and closed sale rose 43.3%, which can be attributed to the tax credit. 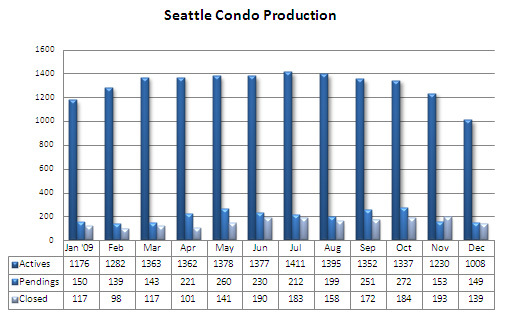 The number of active condo listings dropped to 1,008 units, the fewest number of units available since March 2007. 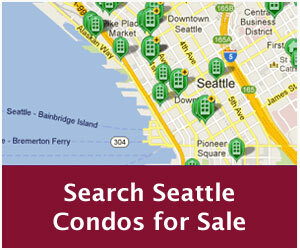 While that may mean fewer choices for buyers today, the number of listings will increase as we head towards spring. 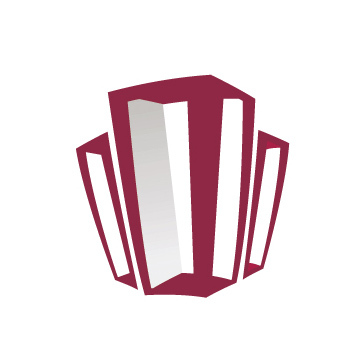 This figure only contemplates those units listed in the NWMLS database and does not include available properties in newly constructed buildings such as Enso, Olive 8 and Escala. 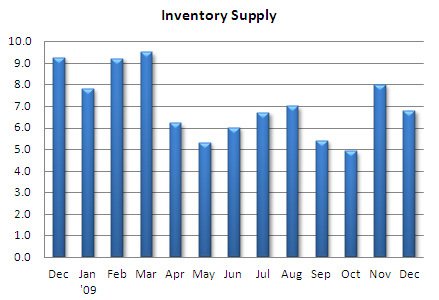 With fewer listings available, the inventory supply rate dipped slightly in December to 6.8 months of supply – the cusp between a buyers market and a normal market. 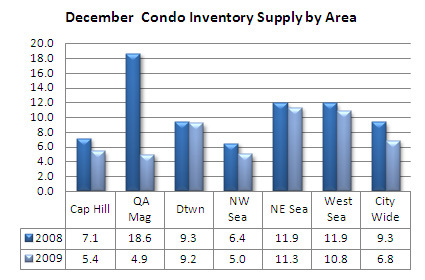 Citywide, the area inventory supply rates fared well compared to last December. 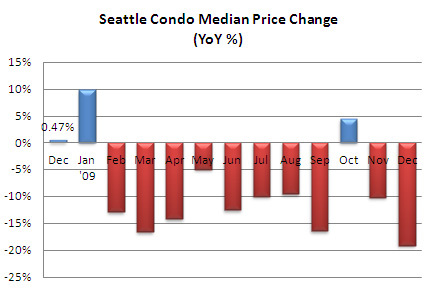 Looking forward, we’ll continue to see a challenging condo market place this year. Though, we experienced an uptick in activity (new listings and buyers entering the market) at the end of December so that may bode well for the start of this new year.